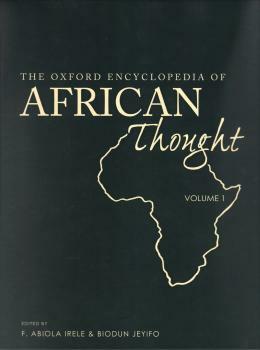 From St. Augustine and early Ethiopian philosophers to the anti-colonialist movements of Pan-Africanism and Negritude, this encyclopedia offers a comprehensive view of African thought, covering the intellectual tradition both on the continent in itsentirety and throughout the African Diaspora in the Americas and in Europe. The term "African thought" has been interpreted in the broadest sense to embrace all those forms of discourse - philosophy, political thought, religion, literature, important social movements - that contribute to the formulation of a distinctive vision of the world determined by or derived from the African experience. The Encyclopedia is a large-scale work of 350 entries covering major topics involved in the development of African Thought including historical figures and important social movements, producing a collection that is an essential resource for teaching, an invaluable companion to independent research, and a solid guide for further study.